Welcome to the Annual Byteland Shooting Contest. Each competitor will shoot to a target which is a rectangular grid. The target consists of r*c squares located in r rows and c columns. 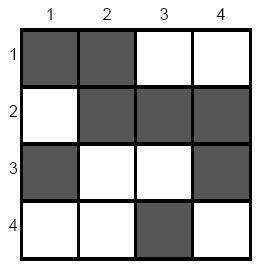 The squares are coloured white or black. There are exactly two white squares and r-2 black squares in each column. Rows are consecutively labelled 1,..,r from top to bottom and columns are labelled 1,..,c from left to right. The shooter has c shots. A volley of c shots is correct if exactly one white square is hit in each column and there is no row without white square being hit. Help the shooter to find a correct volley of hits if such a volley exists. Volley of hits at white squares in rows 2, 3, 1, 4 in consecutive columns 1, 2, 3, 4 is correct. Write a program that: verifies whether any correct volley of hits exists and if so, finds one of them. The first line of the input contains the number of data blocks x, 1 <= x <= 5. The following lines constitute x blocks. The first block starts in the second line of the input file; each next block starts directly after the previous one. The first line of each block contains two integers r and c separated by a single space, 2 <= r <= c <= 1000. These are the numbers of rows and columns, respectively. Each of the next c lines in the block contains two integers separated by a single space. The integers in the input line i + 1 in the block, 1 <= i <= c, are labels of rows with white squares in the i-th column. For the i-th block, 1 <= i <= x, your program should write to the i-th line of the standard output either a sequence of c row labels (separated by single spaces) forming a correct volley of hits at white squares in consecutive columns 1, 2, ..., c, or one word NO if such a volley does not exists.